We eat cereal every morning. While we are big Multi Grain Cheerios and Honey Bunches of Oats fans, sometimes, when we’re feeling ambitious, we’ll make our own. 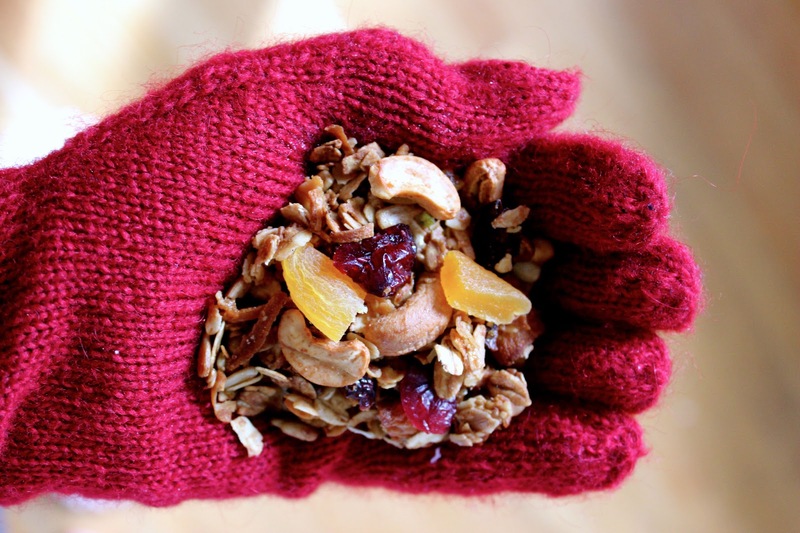 For a more substantial start before winter ski trips, we often bake a big batch of granola. The crunchy, hearty, nutritious blend of energy packed oats and nuts will fuel us on the mountain for hours. The best part of making your own granola is customizing it. Some opt to keep the theme simple with a few walnuts and raisins, some add a jolt with chocolate covered coffee beans, others seek a tropical theme with dried bananas and macadamia nuts...the possibilities are endless for any personality. We basically feature whatever is in our pantry. We love incorporating cashews, dried apricots, flaked coconut, and a hint of Didi Davis’ Vanilla Salt for a sweet and salty combination. We often have sunflower seeds and dried cranberries on hand, so will throw those in too. You always need a binder, so we opt for olive oil which is not too overpowering, and you always need a sweetener, so we use a blend of maple syrup and honey. We could stop right there and enjoy the crunchy blend by the palm-fulls (which we usually do on the return of a day of skiing), or we could further enhance the experience with an add-in. We love submerging granola in almond milk with sliced banana in the morning, layering the blend in a parfait with Greek yogurt and berries for a sweet lunch, or sprinkling the crumbles on ice cream with a drizzle of honey and sliced melon for dessert. Have fun out there! Preheat oven to 300 degrees Fahrenheit. In a large bowl, combine the oats, cashews, sunflower seeds, coconut, vanilla salt and cinnamon. In a small bowl, whisk together the EVOO, honey, and maple syrup. Pour the liquid into the dried mixture and stir to combine. Spread the mixture on a parchment-lined baking sheet in an even layer and bake. After 15 minutes, stir the toasting bits with a spatula and sprinkle the dried cranberries and apricots on top. Let bake for another 15 minutes until golden brown and toasty. Remove from the oven and let sit for at least 15-20 minutes before serving. Makes 8 cups. When the granola is completely cool, package it in an airtight container to enjoy for weeks or freeze it to enjoy for longer!